a secret garden filled with butterflies. 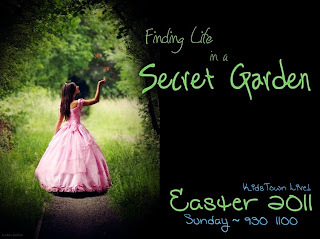 This Easter all attending guests were treated to a simply magical production of Finding Life in a Secret Garden. Written by Pastor Josh Baker and Directed by Amy Leslie and Amy Small, this story was a spiritual re-write on the old beloved classic story, The Secret Garden. Our story told the tale of Mary, a war refuge child who loses her parents and has to go live with a depressed Uncle who's wife has also died. Being forced to live locked away in a bedroom, Mary discovers a hidden doorway to the outside world and to a boy named Dicken and a Garden believed to be dead. Mary soon discovers it isn't really dead, just like she isn't either. Mary comes to learn about life in the Garden and a renewed life she can have too from the Garden's Creator.